Harvard Business School Press, 9781625274120, 224pp. Have you ever felt you're not getting through to the person you're talking to, or not coming across the way you intend? You're not alone. That's the bad news. But there is something we can do about it. 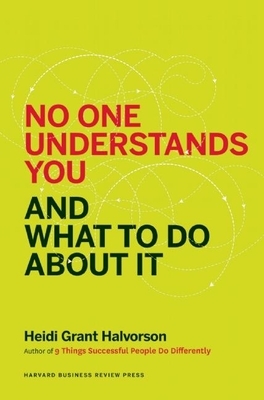 Heidi Grant Halvorson, social psychologist and bestselling author, explains why we're often misunderstood and how we can fix that. Most of us assume that other people see us as we see ourselves, and that they see us as we truly are. But neither is true. Our everyday interactions are colored by subtle biases that distort how others see us--and also shape our perceptions of them. - Trust. Are you friend or foe? - Power. How much influence do you have over me? - Ego. Do you make me feel insecure? Based on decades of research in psychology and social science, Halvorson explains how these lenses affect our interactions--and how to manage them. Once you understand the science of perception, you'll communicate more clearly, send the messages you intend to send, and improve your personal relationships. You'll also become a fairer and more accurate judge of others. Halvorson even offers an evidence-based action plan for repairing a damaged reputation. This book is not about making a good impression, although it will certainly help you do that. It's about coming across as you intend. It's about the authenticity we all strive for. Heidi Grant, PhD, is a social psychologist who researches, writes, and speaks about the science of motivation. She is Global Director of Research & Development at the NeuroLeadership Institute and serves as Associate Director of Columbia's Motivation Science Center. She received her doctorate in social psychology from Columbia University.